LIC Jeevan Saral Plan is an Endowment Assurance plan where the insured can choose the amount and mode of premium payment. LIC Plan No. 165 provides the financial protection against death throughout the term of the plan. 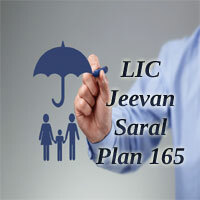 LIC’s Jeevan Saral Policy was introduced on 16th February 2004 by the Life Insurance Corporation. Under this plan, once the premium is chosen, the Sum Assured payable on death will be determined, irrespective of the age and policy term. The Death Benefits are also related to the premiums paid. LIC Jeevan Saral Endowment Plan provides both life security and money savings. It is the most sold plans of LIC and also a non-unit linked insurance policy with Double Death Benefit of Return of Premium and Sum Assured. Moreover this LIC Plan 165 provides flexibility of liquibility and term. Hence because of its flexibility, this plan is also called as ATM Plan (Any Time Maturity Plan). The Key features, Eligibility Conditions, Benefits, Rebates, etc. of LIC’s Jeevan Saral Plan are mentioned in detail below. Refer our site www.policybook.in for more information regarding LIC Endowment Plans. What are the Features of LIC Plan No. 165? Higher risks were covered at the minimal premium. The mode of Premium payment can be chosen by the insured, i.e., you can pay the premium in yearly, half-yearly, quarterly, or monthly modes. After three years of premium payment, life insurance cover can be extended for one year. Loyalty Additions are provided from 10th policy year onwards. Optional higher cover through Term Rider, Accidental Death, and Disability Benefits. Sum Assured is 250 times the monthly premium amount. Loyalty Additions are available which may be payable from the 10th year onwards depending upon the experience of the Corporation. It contains a smooth return, higher death cover, liquidity and lot of flexibilities. Upto 49 years: Rs. 62,500. 50 years & above: Rs. 1,00,000. The Benefits of LIC Jeevan Saral Endowment Plan are mentioned below. Return of premiums excluding first-year premiums and extra/ rider premium(if any) shall be payable in Lump sum. Maturity benefits under this LIC Endowment Plan 165 are the Maturity Sum Assured + Loyalty Additions if any is payable in a lump sum. These are the optional benefits for extra protection which can be added to the basic plan. However, you have to pay an additional premium for these benefits. The LIC Jeevan Saral plan offers an auto cover of 12 months after the policy has been in force for 3 years or more. LIC Jeevan Saral Policy as a with-profits plan gets a share of profits in the form of Loyalty Additions. These are the terminal bonuses payable along with death benefit or maturity benefit. From the 10th policy year onwards loyalty additions are provided which depends on the experience of the corporation. Surrender Values are available on earlier termination of the contract and also allows for partial surrenders. Guaranteed Surrender Value (GSV) = 30% of the total amount of premiums paid (excluding the premiums for the first year) + all the extra premiums and premiums for accident benefit / term rider. If the premiums have been paid 3 or more years but less than 4 years, Maturity Sum Assured will be 80%. If the premiums have been paid 4 or more years but less than 5 years, Maturity Sum Assured will be 90%. If the premiums have been paid 5 or more years, Maturity Sum Assured will be 100%. SSV = Discounted or Accumulated value of maturity sum assured + loyalty addition. CEIS Rebate is available for this LIC’s Jeevan Saral Endowment Plan which is 10% of the basic premium. LIC’s Accidental Death and Disability Benefit Rider (AD & DB) is an optional rider that can opt for at any time within the premium paying term. This rider is available up to the maximum Sum Assured of 50 Lakh. The Permanent Disability Benefit (PDB) is not available under this LIC plan no 165. The Sum Assured for this rider is the death sum assured. However, Accidental Death and Disability Benefit Rider is not available for the auto cover period. LIC New Term Assurance Rider plan can be attached to a basic policy to provide add-on benefit at a nominal cost. LIC offers this optional rider for this Jeevan Saral policy by payment of additional premium. LIC Jeevan Saral Premium Calculator is used to calculate the premium amount in Yearly, Half Yearly, Quarterly, and Monthly modes. Through LIC Jeevan Saral Maturity Calculator, you can calculate the Jeevan Saral Premium amount that has to be paid to get all the benefits available under this policy. The data required for calculating premium rates using Jeevan Saral Calculator are Name, Email-Id, Age, Term, Sum Assured, etc. The Buying process of LIC Jeevan Lakshya policy is very simple if you have all the information regarding documents with you. Life Assured can buy the LIC Plan 165 either by visiting the direct website or by approaching LIC Agents. You have to choose the premium payment mode and pay the premium by cheque or DD or using net banking. Once the policyholder completed the premium successfully, he/ she can claim for the maturity benefit available under this plan. The Maturity claim for term assurance rider is not payable. The Sum Assured will be payable to the nominees/ assignees if the insured dies unfortunately within the policy term. The Death claim with and without assurance rider is mentioned below. Death claim = Basic death sum assured + Term rider sum assured + (return of premiums – first-year premium and extra/rider premiums/EPDB premiums if any) + loyalty additions – o/s loan with interest if any. Loan Facility: The Loan facility is available for the policyholders under this policy. Paid-Up Value: Depending on the number of premiums paid, paid-up value shall be payable on death or maturity. Policy Revival: If the policy lapsed, it might be revived within a period of five successive years. 1. How do I revive a Lapsed Policy? A. You can restore the lapsed policy during the lifetime of the assured, but within a period of 5 years from the due date of the first unpaid premium and before the date of maturity. 2. Are there any riders available under this plan? A. There are two riders available under this LIC Jeevan Saral plan. They are Accidental Death & Disability Benefit Rider and New Term Assurance Rider. 3. What is meant by Loyalty Addition? A. Loyalty Addition means the share in profits and the terminal bonuses payable along with death benefit or maturity benefit. I have LIC plan no 165 term 21 but I want to increase the term up to 25 or 30. Please let me know is it possible to increase the term or not.